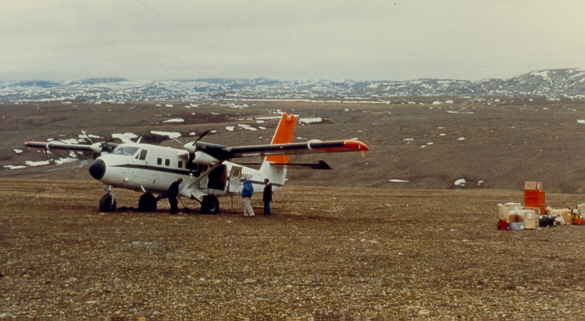 Twin Otter plane, just landed on the tundra North of Hare Fiord. Glaciers are touching the sea across the Fiord. Similar, detail, with Fried Schwerdtner. The pilot shouts: “Is this were you want to land?”. You respond with “Yes” and he will respond with “Let’s try it”. The plane make a few loops around the proposed landing site and suddenly touches the uneven ground hitting rocks and shaking with a load roar of the engines with the propellers in reverse to break. One minute you are in a comfortable plane, the next minute you are on a cold tundra. The first thing you do is set up the tents for shelter and load your shotguns. Landing on the wild tundra in Northern Canada is a tense experience when the proposed landing site is unknown. All you have is carefully studying the aerial photographs and looking for dry flat spots. Will there be a dry 300 m landing spot free of rocks? Will the pilot try it? Where do you go as a fall back? It must feels like landing on an aircraft carrier, very tight. One minute you are in the air, another minute you are circling above the target landing area and hit the rough ground. There is the load sound of the oversized rubber tires hitting rocks and the load roar of engines with the propellers in reverse to break. As long as you are still in the plane you are still surrounded by the conveniences of civilization including the plane noise and nauseating smell of jet fuel but after the landing you will be on your own for the next two months, living in tents at freezing temperatures. Surviving the landing is just the start of a real hardship period, cold and lonely. Resolute Bay is the only airport with scheduled flights and the only transport in the vast region of the Canadian Arctic Islands is a chartered plane or helicopter . The plane mostly used is the reliable Twin Otter, a two engine bush plane. It can land in freely picked spots on the tundra using oversized soft tires provided you limit the payload to 3000 pounds . The plane only needs 100 m to land and a straight clear space of 300 m, similarly for taking off. The biggest risk in landing is the muddy thawed tundra where the tires sink in the soft ground and the planes gets stuck. Pilots look for dry or nearly dry places to land. In the early summer these are rare as the tundra is still wet. A plane stuck in the mud is a disaster as the only other plane will need to land nearby to pull it out and this means that for that day none of the two government planes are available. Also, the common poor flying weather conditions may stop flying for several days and there tends to be a backlog forcing pilots to fly 16 hours a day at times. 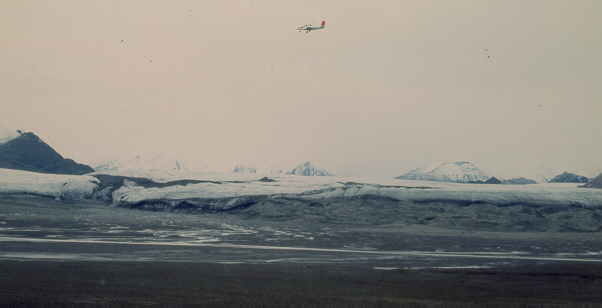 In 1982 we were dropped in the field by landing on a hillside on Eastern Axel Heiberg Island. There were six of us and for five this was our first trip, unaware what to expect. The first spot near Whitsunday Bay was rejected, too difficult for such a heavy plane. 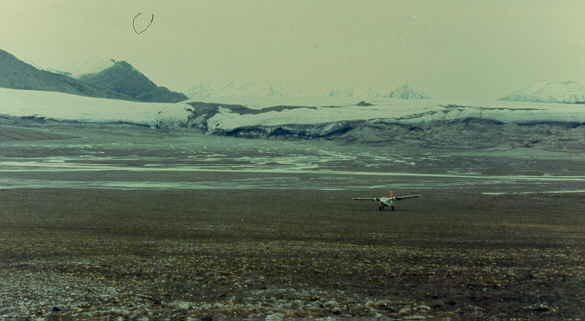 The pilot got an approximate position near Gibbs Fiord and picked a landing spot on a hill side. Hitting the ground felt like a crash. There was a loud roar of engines putting the propellers in reverse. The landing was bumpy but we stopped within a 100 m, making tire marks in the wet tundra. Bit surprised how easy this was, we unloaded the plane. As it was now empty, it only needed a hundred meters to take off. We would be on our own for the next eight weeks. 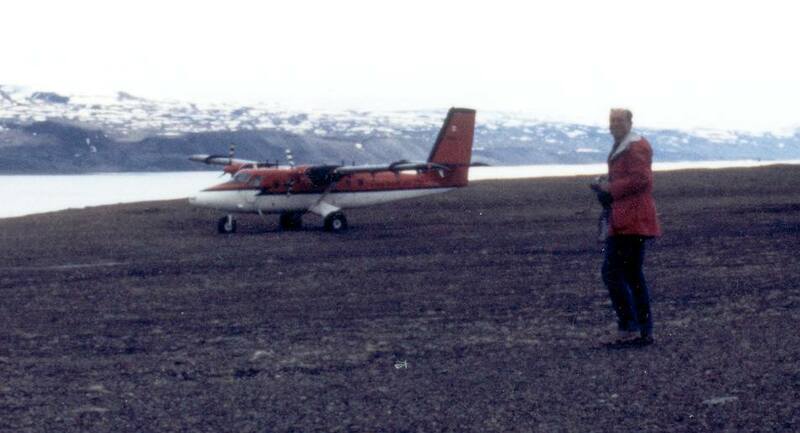 After 8 weeks in mid August a Twin Otter would pick us up near Buchanan Lake. It easily landed on the gravel bars of the vast flood plane. It took off using a natural runway of two hundred meters, which is very comfortable. The noise and typical smell of jet fuel indicated we were going back to civilization but after 8 weeks camping in the wild I was very happy this was over. In 1983 the students were Jeff Torrance, Jeffy for short, an MSc student, and Steve and Martin, summer students hired as field assistants. We decided to start the work in early June to have two weeks extra. However, this was not a good choice as this year spring was late. We tried to land at Whitsunday Bay but after 8 loops the relatively old (around 60) but very experienced pilot decided against it, "Too wet" he shouted, and "Other camp". I still managed to yell to him "East of the mountain", before collapsing due to airsickness caused by standing up during the sharp loops combined with an acid breakfast of grapefruit. Jeffy took over the navigation and the pilot found a perfect gravel bar for landing. However, not 4 km across the mountain with the salt dome as planned but 8 km further to the east as this was the only good landing site. It was cold that week. The area was fully covered in snow and worse the freezing temperatures froze our vegetables at night, mostly potatoes and carrots and these started rotting within a few days. After a week we again tried to land at Whitsunday Bay and the now much younger pilot saw no problem although the tundra was still similar, with dry and wet spots. He took one loop and landed  while the big soft tires of the plane hit a few rocks during the landing. He couldn't avoid those, he said, as they on the only bit of dry area but this was no problem. 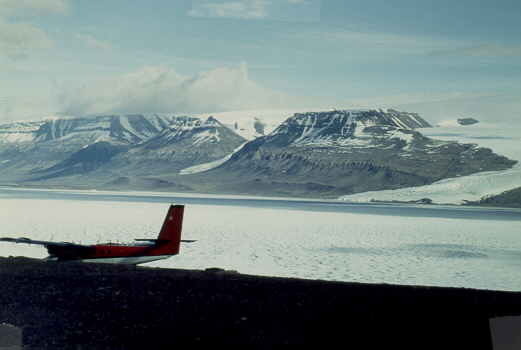 Twin Otter landing on the tundra at Expedition Fiord, in front of the main Expedition Glacier, about 10 km wide and 80 km long. Distance to glacier is 6 km. Photograph taken during the bright mid summer night at 3 AM in the morning in late July. Expedition Fiord is a little oasis enclosed by glaciers and mountain ridges and our camp was well sheltered from the constant fierce Northern wind [10 km wide Thompson Glacier at 6 km distance]. It was now the end of the season and we shot off the unused parachute flares and small flares  and burned a torn up tent using gasoline and flares  after using it as a toilet tent. This is a real comfort from crouching outside in the cold wind. I made the mistake of firing off a parachute flare secretly standing in the tent door to surprise Jeffy but the tent was quickly filled with a suffocating sulfur smoke. The camp was very pleasant but I did get irritated for some reason by the noise of the fast flowing streams during the occasional warm weather unable to sleep well. The pick up at the end of the season was on time as we had window of good weather. The plane had an older pilot, the same person who refused to land at Whitsunday Bay in 1983 but now he did not even make an extra loop. He arrived after midnight, flew over the Expedition glacier , did not make a single reconnaissance loop but landed in one go. After he landed he told us this area was like an airport . He was already working for 24 hours with little sleep, a bit in a hurry due to the back-log as the previous week the weather was too poor to fly. During the 2.5 hour flight to Resolute he spotted Beluga whales and said "Lets go whale watching" and made a sharp turn and descended to just above sea level. I did see the whales. 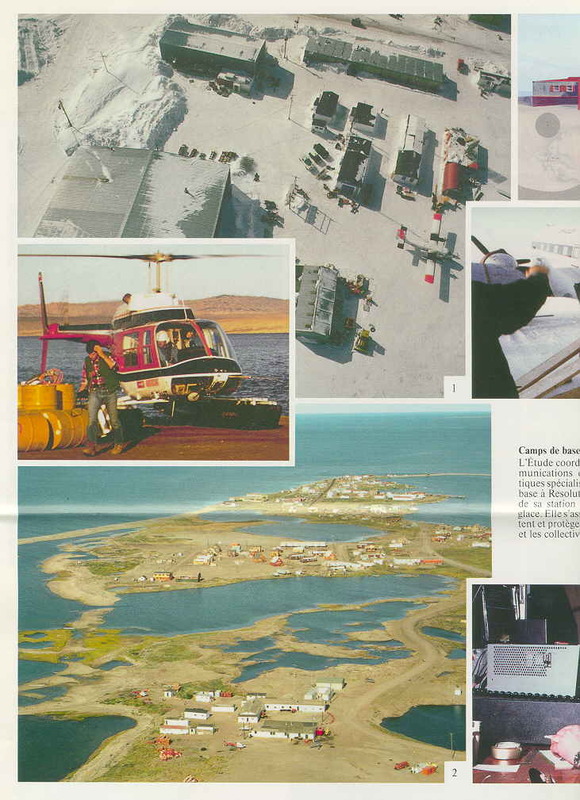 In 1988, after landing in Resolute Bay with a one-day delay, we were asked if we could be ready to go in 2 hours as the weather was good for flying. "Aaahh, yes, no problem", I responded. Happy not to loose any more time. I was convinced I could sort out the food and gear quickly using six years of camp gear experience and with the help of one of the base aids, a very pleasant Newfoundlander I knew from the previous years. He worked here from January to October for the past 6 years leaving his family down south and was hoping for a promotion as coordinator in the radio room. 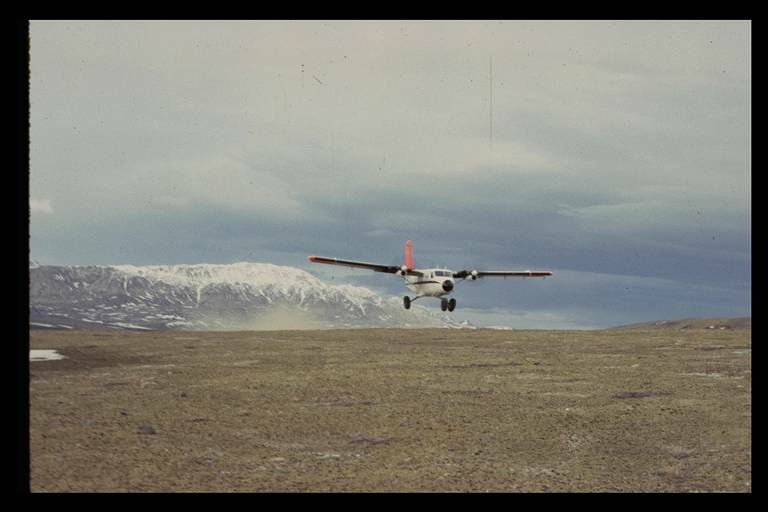 We soon took off by Twin Otter plane and three hours later were dropped off in a cold, windy and rocky, uneven streambed on Northern Ellesmere Island, North of Hare Fiord. The landing in the stream bed was rough, hitting several rocks. This was a big contrast from Toronto 36 hours earlier which had a heat wave with a temperature of 36-37 degrees Celsius. This area at 81 degrees latitude is much colder than Axel Heiberg Island as it was closer to the Arctic Ocean and surrounded by glaciers. It was still mostly covered in snow and temperatures were around zero Celcius. Now it took me two weeks to get used to the cold and fighting the routine first week cold was not easy this year. 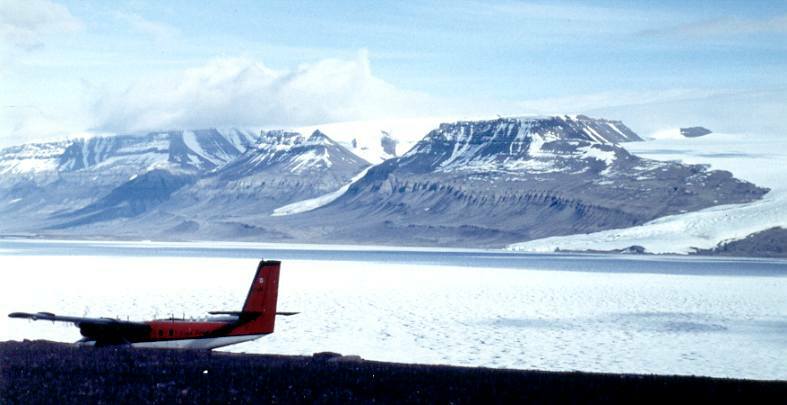 The 1989 expedition on Northern Ellesmere Island was the year of snow, snow and snow. Freak weather systems kept on rolling in from the south and covered the mountains in a near permanent layer of one or two meters of snow. Only near sea level the snow would melt. This is very unusual for this area, as it is know to be an Arctic desert. We went with a large group, our professor, Matt from England, the MSc student with his field assistant and Jeff (another student) my field assistant. With the experience of last summer realizing Northern Ellesmere Island is much colder and using the knowledge from the Newfoundland fieldwork in 1985, 1986 and 1987, I ordered Coleman gasoline lamps as portable stoves, surprising equipment for an area that never gets dark. These proved to be very good to heat up the tents, especially in the morning. We would always light a lamp before getting up and in 5 minutes the tent would be warm. In Resolute Bay we met an artist who installed a one-meter compass needle (for a horizontal rotation) and half meter long inclinometer needles (for a vertical rotation) outside the base near the sea . As we were so close to the magnetic pole, only 100 km, they spun around slowly, both vertically and horizontally in a seemingly chaotic way. The six of us were dropped of North of Hare Fiord on Northern Ellesmere Island on a muddy tundra near the shore making deep tracks in the soft tundra and luckily the plane did not get stuck . The first week near the coast was fine and the only (pleasant) incident was the pack of 4 wolves [white dots in the distance] but always kept a large distance. They came back to our camp several times and we left a student home to guard the tents. The scenery here is special, frozen sea ice , icebergs  and glaciers almost touching the sea . You are visitor # since August 2004.